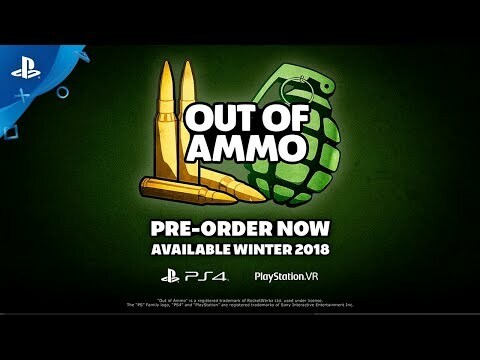 Out of Ammo is an intense virtual reality strategy game for PlayStation®VR that puts you in the commander's seat against wave after wave of soldiers. Construct defenses, call in artillery, issue orders, and take control of your soldiers directly in order to survive for as long as you can! With a simple yet engaging aesthetic approach, Out of Ammo puts players in the roles of general and grunt in the midst of heated battles, intensified by the immersion of virtual reality. As general, players dictate where to place fortifications and troops. Once a sound strategy is at hand, it’s time assume the identities of any soldier on the battlefield, whether shooting machine guns and throwing grenades at the front lines or carefully executing sniper blasts from watchtowers—they can even heal other units as a medic and fortify damaged structures as an engineer. Switching between viewpoints is vital to success as the enemy changes its own approach in real time. You are the General, commanding your toops as they build up an unbreachable base, issuing commands to your troops, placing buildings in key spots and calling in bombing runs. Take direct control of your soldiers to defend yourself hands-on and make short work of the baddies with a variety of unit types and weapons.